of 72...that is right...a total of 72 note cards is what I made! As most of ya know I can't just make one of a card, I would rather make 4-6 of a card because to me it just makes sense *okie shrugs*. I started the note cards as an idea for a birthday gift for a family member and then I thought "dang I will need prizes for my annual Girlfriend Christmas Party so I might as well make some for that". So I did. 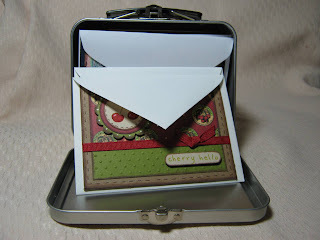 Here is the little tin I altered to put the note cards in. Not all the sets have a tin, just one very special set and I can't say who it is for since they might read my blog and it would ruin the surprise. 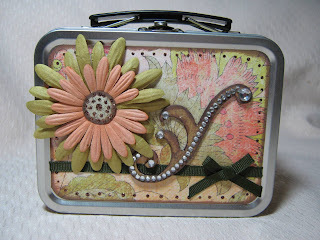 I used a small Tim Holtz tin and I wish I had about 2 dozen more of these but sadly this was my last one! I used a chipboard swirl and covered it with paper and added some bling to jazz it up a bit. The paper is Fancy Pants and the flowers are prima's. I know the ribbon doesn't look like it matches in the picture...but it does in person *okie things photographs are very strange things sometimes*. And yes I used some stickles! The note cards measured approximately 5 x 3.5 inches so they fit nicely in the tin as you can see here. I had no problem fitting all 12 in the tin and probably could have fit a few more...but 14 or 15 just doesn't seem as nice as an even dozen...and besides...I was running out of ideas! If you have problems seeing the cards you can click the pictures to make them bigger. In this first set I have "cherry hello", "you are the best" and "thinking of you". The papers were mostly from scraps and vary by company. I used the Stampin Up scallop punches on these. Even the "cherry hello" is an SU punch...it is called word window. The little cherry stamp is from a Stampedous set as is the sentiment. The sentiments on the other two cards are Studio G's. Again I used mostly scraps. The stamps are all Studio G's. The cupcake one is a wood block one *okie knows it will have to be unmounted if it wants to stay in her collection*. I also used some border punches on these. The scallop is Stampin Up, the scallop with dots is Fiskars Threading Water *okie has no idea how ya thread water and thinks it is a ridiculous name for a punch* and the scallop with half circles is a Martha Stewart punch called Apron, I think anyway. The white flower is also a punch, it is EK Success Daisy Whale of a Punch. I double layered the flower and curled the petals slightly for some dimension. The "hello" card is probably my least favorite of the bunch. I tried my hand at paper piercing and let me tell you...I NEED MORE PRACTICE! My daughter thought it was just down right ugly! LOL The flowers on the other two cards are from Michaels in the wedding section. A friend of mine sent them to me and I think they are fantastic for little cards. If I remember correctly I think they are about $5 for a little bucket and there is a lot in the bucket! The tag is the Stampin Up tag punch. The pink flower card has the Martha Stewart double lattice punch used on it. I also used the cuttlebug distressed stripes *okie so loves that embossing folder*. As you can see there is the card that started it all...the coffee card! It is a My Favorite Things stamp set. The "friends" card has 3 different punches used. I am not sure what the border punch is called but it is a Martha Stewart punch as is the little butterfly. I use that butterfly a lot! The sentiment is the curly label punch. I stamped the image on the green paper and then punched it. I then stamped the image on ivory paper and cut around the oval. The "friends" in the center is from an Inkadinkadoo set I have. Okay WHO DOESN'T LOVE THE LADYBUG CARD?? And if you said "me" then you can leave my blog now! *okie gives mean dirty looks at the crowd lookin for anyone who doesn't love the ladybug card*. My friend ScrapperDelighted sent me a couple of sheets of that ladybug paper and I knew I had to use it! The ribbon came from the LSS that closed down last year. I used several circle punches for the sentiment to acheive the effect I got *okie makes it sound like she planned it the way it looks when in reality she just couldn't decide on what to do and kept punch paper*. The little sentiment is a Studio G stamp. Great job - you are so creative! Love all of your fabulous note cards and the tin idea. What a sweet present for your friend. Will have to use your note cards as inspiration to get working on some...would be a great Christmas present. :) TFS! Great cards, the recipients are very lucky. Glad to see you posting again. You have very fortunate friends! I know what you mean about making more than one card....it doesn't take that much longer to make 4 or 6, and then you HAVE them! WOW, you have been a busy busy girl...love this. Oh, Oh! I LOVE THESE CARDS and the tin you did for them!! I used to make sets of cards for my close friends and I really miss it. You do such amazing work! Thanks for the inspiration! Great idea. I'm doing a set of cards for a silent auction item and I was trying to figure out what to put them in. Thanks for the GREAT idea.